This article is about the move order between players (who goes first/second/last). . For information about all the phases in a turn, see turn phases. Warzone will always execute your orders in the order that you supply them, mixed in with the orders from the other players. In the Orders list in the top-right, you can re-arrange your orders by clicking on them and using the up and down buttons. Sometimes it is advantageous for your orders to happen early in the turn, other times it is better for your orders to happen after your opponent's orders. When you want an order to happen after your opponents, often it is useful to execute "dummy" moves first (simply moving armies around within your own territory) so that your important moves happen later in the turn rather than sooner. At least one army must actually move. If no armies move, it won't delay your orders at all. For example, if you execute a transfer only order to a spot you don't control, this won't result in any armies moving and therefore won't delay your later orders at all. Players can specify one of three ways that the move order will work for their game when they create it: Random, Cycle, or No-Luck Cycle. You should check the Settings panel of a game to see which mode it's in. When a game is configured to randomize the move order, Warzone will randomize the move order on each turn. Each player's first order is executed in this random order, then each player's second order, and each player's third. This means that in 1v1 games you always have a 50% chance that your first order will happen before your opponent's first order. For the next round of attacks, the order is reversed so the last player in the first round gets the first move in the second round. It then reverses again for the third round, and so on. This process continues until all orders are executed. In team games, Warzone ensures that teams are first randomized into their own move order, and then the players within each team. For example, in a 2v2 game, it's not possible for both of team A's players to get to move before any of team B's players. The first turn of a game is randomized just as it would be in the Random Move Order system presented above, but subsequent turns reverse the order each time. For example: ABCD becomes DCBA the next turn, then returns to ABCD for the third turn. This means that, unlike the random move order, the move order is predictable. The game does not tell you who goes in what order; you must deduce it by observing the sequence that orders happen. Note that it is possible to deduce the sequence from deploy orders as well as attack/transfer orders, because deploys happen in the same sequence as moves. This works well for 1v1 games, since one player will get first move on all of the even numbered turns while the other player gets the odd numbered turns. In games with manual distribution, the order in which territories are distributed is considered part of the cycle. For example, in a game with two players (A and B), if player A gets their first pick, player B will get first move on the first turn. No-Luck Cyclic is like Cyclic, except that it aims to remove the random roll on the first turn. The initial order of the cycle is determined by how fast each player plays during their first turn (or during territory distribution if it's a manual distribution game). Whoever plays fastest will be placed 1st in the first move order, and the second fastest player will be placed 2nd, etc. After the initial order is determined, move order will simply swap back and forth just as it would in cyclic move order. In order to make this fair, the game will only measure the time from when you began playing your first turn until when you complete it. When a game begins using this move order, the map is initially hidden and a the begin dialog appears. Clicking the begin button reveals the map and starts your timer, which will stop when you commit orders or picks. If you modify your orders on the first turn, it will extend your total move speed to encompass the entire time from when you begun until your final commit. For example, if you begin taking your turn at 1:00pm and commit at 1:10pm, your play speed will be 10 minutes. However, if at 1:30 you change your mind and change your orders/picks, your play speed will update to 30 minutes. 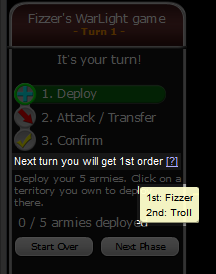 You can hover over this label to see the entire move sequence for the next turn. In team games, the slowest player's time of the team will be used to determine the order of the teams in the cycle. Then, within each team, the order is determined by the move speed of each player compared to their teammates. After Warzone determines the move order, using the method explained above, it will execute each player's first order within each phase. Then, it reverses the move order, and executes each player's second order. It continues this process until all orders for that phase have been executed, then moves on to the next phase. This page was last modified on 17 November 2018, at 02:33. This page has been accessed 235,778 times.